What it’s about: Not strictly speaking a war, but the first of three small-scale armed conflicts between Mormon settlers and their non-Mormon neighbors. The third, the Utah War, finally established that territory, and then state, as a permanent home for the faithful. The second, based on its mentions in Wikipedia, seems to be called the lesser-known Illinois Mormon War, which followed the death of Joseph Smith, the religion’s founder, in 1844. But the Missouri conflict was also pivotal to the religion’s history, as a key part of its move ever-westward after its founding in upstate New York. Biggest controversy: For a time, Independence, Missouri was the Mormon promised land, a distinction that was lost on other Missourians. In 1830, Joseph Smith proclaimed, “If ye are faithful, ye shall assemble yourselves together to rejoice upon the land of Missouri, which is the land of your inheritance, which is now the land of your enemies.” He revealed that Christ was due to return soon, and that the city of Zion (a utopia Mormons believe will arise after the Second Coming) would be outside of Independence. Mormons began to stream into surrounding Jackson County, believing, as Smith had foretold, that the “land of your inheritance” was rightly theirs. Which the land’s current occupants—i.e., “your enemies,” in Smith’s words—were none too pleased to hear. Strangest fact: The Missouri Mormons founded a town called Far West, which, despite its name, is close to the direct center of the United States. (In fact, it’s a bit east of that spot.) When the Mormons were driven out—even farther west—the town became a ghost town, although it eventually became an Latter Day Saints-maintained historical site, and a local congregation meets there to worship. Thing we were unhappiest to learn: That perfect peace didn’t last. By 1837, the Church was comfortable enough in Missouri that their headquarters relocated from Kirtland, Ohio to Far West, bringing hundreds more settlers with them. Eventually, Caldwell County ran out of room, and Mormons began settling neighboring counties. This stirred up familiar tensions, especially in Daviess County, which was more or less equally split between Democrats and Whigs, and the Mormons could tip elections as they saw fit. From that point on, mob violence escalated, driving Mormons from De Witt (a previously abandoned town they had settled). While Mormons protested that, as American citizens, they had the right to settle where they pleased, they were driven out of settlement after settlement by armed mobs. 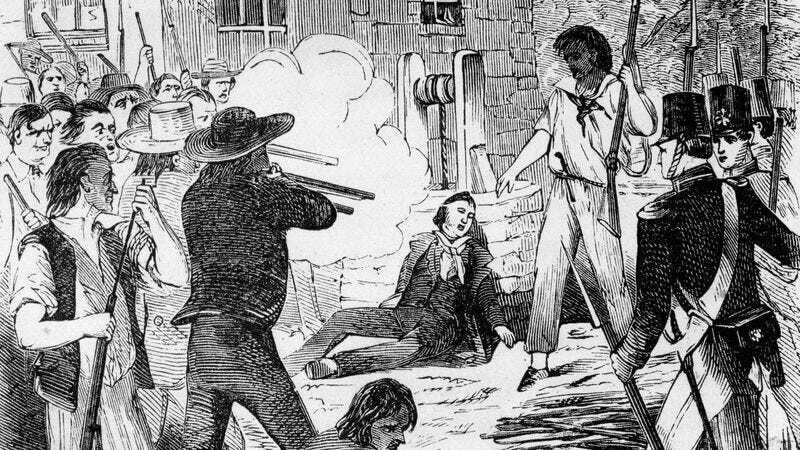 Magnificently named Missouri Governor Lilburn Boggs refused to intervene, saying the “quarrel was between the Mormons and the mob.” Without any state oversight, counties formed militias and began threatening violence. The Mormon’s Caldwell County militia marched on a neighboring county to protect settlers there, and burned non-Mormon homes. Last week’s Wormhole subject, state militia general David Rice Atchison, authorized militia troops to patrol the Caldwell County border, but they overstepped that order, firing on the Mormon militia. The Mormons drove the state militia out, but took heavier casualties (two deaths to one, although more Mormons were injured as well). Reports of the battle were exaggerated, with some saying that the state militia had been wiped out completely. Governor Boggs reacted to these rumors, signing an executive order saying, “the Mormons must be treated as enemies, and must be exterminated or driven from the State.” (Missouri didn’t rescind the order until 1976.) It didn’t matter, however, because by that time, an armed mob of 250 had stormed into Caldwell County, killing 17 and wounding many more in what was named Haun’s Mill massacre. The state militia followed this up by laying siege to Far West. Joseph Smith surrendered, and met the demand that the Mormons leave, saying he would be glad to put the “damnable state” behind him. Militia general Samuel Lucas held a court martial of the Mormon leaders and ordered their execution, but fellow general Alexander Doniphan refused, calling it “cold-blooded murder.” Smith and several church leaders were still held on charges of treason, although Smith escaped, and led the faithful to Nauvoo, Illinois, where the Mormons were never bothered again—until Smith died five years later and his flock was driven out again, finally settling for good in Utah. Best link to elsewhere on Wikipedia: When Smith escaped from jail, locals were so outraged that the sheriff was ridden out of town on a rail. As mob violence goes, it was a mild form of torture, as the victim generally straddled a fencepost that was carried around by several other men. The victim would be paraded about town before unceremoniously being dumped from the rail—the intention more to display the person’s shame than to do them harm. However, in this instance, the mob used an iron rail, and the sheriff later died from injuries he received. Further down the Wormhole: Riding on a rail is just one form of vigilante justice. Real-life vigilantism rarely leads anywhere good, but everyone loves a fictional vigilante, none more so than Batman. Is the secret to Batman’s popularity his fusion of tough-guy brawler and nerdy scientist? Or is it his sprawling, often ridiculous rogues’ gallery of villains? We’ll venture into Arkham Asylum next week.